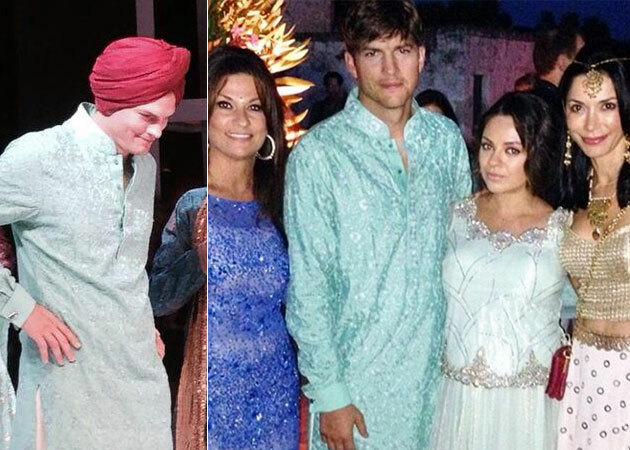 Ashton Kutcher and Mila Kunis attended Ayesha Thapar and Nikesh Arora’s wedding down in Puglia, Italy on July 4th. The couple showed up in Indian attire from head to toe. Ashton supported a blue Kurta with a white dhoti, tied together with a red turban. His baby mama-to-be, wore a traditional blue and silver lengha outfit. Ashton even performed a Bollywood routine with a professional dancer at the wedding! Bollywood Legend’s Son Trying his Hand at Hollywood Producing! Salman Khan looks to ‘Kick” SRK out of Top Spot on Eid! Very cool, love to see the video of Ashton Bollywood dancing ! World SannaKhan is licensed under a Creative Commons Attribution-NonCommercial-NoDerivs 3.0 Unported License.